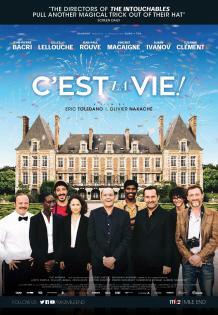 In C’est La Vie, a hugely enjoyable romp from directors Eric Toledano and Olivier Nakache (Intouchables), a cantankerous French caterer has to try and create a fairytale wedding while relying on the most disorganized group of waiters, cooks, photographers and wedding singers in the history of holy matrimonies. Jean-Pierre Bacri plays Max, an I’ve-seen-it-all caterer/wedding planner charged with organizing the momentous day of an ultra-rich couple. His pragmatic motto is ‘We need to adapt,’ and there will be plenty of opportunities to do just that, as nothing goes as planned. First off, there’s the last-minute wedding singer (Gilles Lellouche), who constantly picks fights with Adèle (Eye Haidara), Max’s potty-mouthed second-in-command. Adèle did her friend, Samy (Alban Ivanov), a favour by getting him a waiter position, though he has zero experience. Fellow waiter Julien (Vincent Macaigne) carries a torch for a woman from his past who unexpectedly turns up at the wedding. Meanwhile, Guy, the photographer (Jean-Paul Rouve), seems more interested in the wedding snacks than in his job. And we haven’t even mentioned the ‘small’ requests and ideas that the groom has in mind, including a floating surprise that is the film’s biggest generator of sustained belly laughs. This is a zippy and zinger-filled affair offering carefully crafted character comedy, hilarious slapstick, a cute love story or two, as well as some solid musical moments.